Every three to four months, residents of forest villages surrounding Malajkhand copper mine in Madhya Pradesh pool money to repair their tube wells. Three decades of leaching from the tailings dam of Hindustan Copper Limited (HCL) has turned the region’s groundwater acidic, which corrodes the tube well pipes. Repairing a tube well costs about Rs 1,000, but the Baiga and Gond tribals of these villages have little choice. 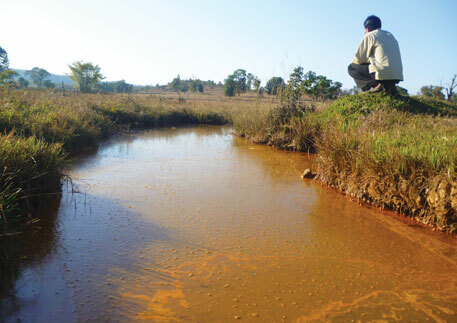 Acidic mine drainage from Asia’s largest open pit mine has already turned streams and traditional tanks in these forest villages yellowish red and unfit for their daily needs. Worse, the waste has turned their farms barren and shortened their lifespan. The fate of these 10 villages may soon be shared by another 134 villages and two towns not far from the mine. The state-owned mining company is set to expand its production capacity from 2 million tonnes per annum (MTPA) to 5 MTPA. For this, it plans to acquire about 250 hectares, which includes a reserve forest. The expansion project is yet to get clearance from the Union Ministry of Environment and Forests. State forest officials say before giving clearance, they want to ensure that HCL does not discharge its acidic mine waste into water bodies in the forests. HCL officials have, however, begun developing the mine for expansion. HCL claims it will install acid and wastewater treatment plants and geo-textiles to reduce acid drainage. But going by their experience, people and activists doubt the claims. “The company has a acid waste treatment plant but it hardly functions,” says Soumitra Roy of Bhopal non-profit Vikas Samvad. Burden of waste Typically, copper occurs as sulphide and carbonate ores in nature. It is recovered either by treating the sulphide ore with dilute sulphuric acid or by grinding the carbonate ore and then treating it with pine oil, lime and xanthate, a toxic compound. The waste material produced during the extraction process contains heavy metals such as molybdenum, nickel, zinc, lead and arsenic. HCL, which began operating the mine in 1982, stores this mine waste in its tailings dam enclosed by piles of fine sand produced while grinding carbonate ores. According to the estimates of Madhya Pradesh Pollution Control Board, the tailings dam holds 50 million tonnes of waste. Leaching of heavy metals from the dam has substantially contaminated the surrounding environment, says a study by Centre for Environmental Science and Engineering at Bhilai Institute of Technology. The study was published in Environment Geochem Health in 2007. P K Pandey, one of the authors, says usually such acid wastes dumped in tailings dams get neutralised to some extent by natural alkalinity. But this does not happen at Malajkhand due to its geology, made up of volcanic rocks. To worsen the matter, HCL has not undertaken any measures for collection and treatment of the acid waste. This results in leaching and contamination, he adds. Besides, Pandey says, unlike industrial wastewater discharge, there is no permissible limit for heavy metals in wastewater released from mining of base metals like copper in the country. The researchers have found traces of heavy metals in the nearby Banjar river that flows through Kanha National Park. “The extent of damage to the environment is so high that it can be termed as criminal negligence,” the study notes. Ground reality corroborates the study’s findings. Forest guard Kalhan Singh from Chindi Tola says, until 2006 the groundwater remained clean. That year HCL set up tube wells in the affected villages. But now the acidic mine waste has contaminated aquifers. Though HCL has begun providing tanker water to each village twice a week it is not enough to meet the needs of 1,500 people. In September last year residents of the 10 villages staged protests at the nearby Mukki gate of Kanha National Park for 35 days demanding safe drinking water and compensation to 410 farmers. The Balaghat district administration asked the Regional Science Laboratory (RSL) of Jabalpur to study if the mine waste is causing crop losses. RSL confirmed the presence of acid and heavy metals in the fields, following which the administration disbursed Rs 8 lakh as compensation to 110 farmers. When asked about the report, HCL officials feigned ignorance and said they had asked NEERI to estimate the impact of the mine waste and are waiting for its report. However, they say, they have adopted eight affected villages and will implement developmental schemes. But will this help alleviate blisters, red patches and several other ailments that the residents deal with every day? Last year, when Singh went near the village pool to rescue his buffaloes from the swamps, he fell into the pool. His body has been covered with blisters ever since. Study by Vikas Samvad shows life expectancy of these villagers has come down to 55 years from 80 a few decades ago. Incidences of diabetes is also on the rise. Rahtam Singh says 70 per cent people in his village suffer from diabetes. HCL set up a mobile clinic for affected villages in 2008, following protests by Akhil Bhartiya Adivasi Mahasabha. “The clinic, with one doctor and two nurses, visits the villages once a month and provides medicines for basic ailments such as flu and diarrhoea,” says Sanjay Uike, former president of Malajkhand municipal area. They do not have medicines for skin diseases like itching and diphtheria, which are common in this area, he adds. Uike and several other residents of these villages are not sure if HCL will be able to contain the contamination once it doubles its production capacity. They now demand a study into what is fouling their water bodies, agriculture and health before MOEF gives a go-ahead for expansion of Malajkhand mine. Will the old fashioned "development" ever end in the 21st century? As the Governments can't seem to adopt the measures that force the industry to be more responsible, civil society has long years of struggles ahead of it. Unfortunately. These Baigas and Gonds are paying the cost for civilisation as Balghat dist has Maganese mines too in Bharveli and share the buffer zone of Kanha National Park and thus their stories of displacement is not new and will only get repeated. FYI the acidic water flows into Banjar river, through stream of water, and further into Kanha National Park. The stream passes through farmlands and has destroyed many hectares of land in the way already. And we are not even talking about expoitation of local villagers who work for many contractors for 12 hours a day for a meagre pay. Sometime back, one of the contractors swindled the all PF money he was supposed to pay workers and many other continure to do so.